Prince of Peace is undeserving of a last name. You got your Twinings, Ahmads, Bigelows, etc. These fore bearers felt their tea was worthy of their last name. Unless your last name is Dooky, it does not belong on the package. So, it’s no surprise the name Prince of Peace has religious overtones. If you can’t sell something based on its merits, taste, design, etc, wrap it in religion. We already know of another brand guilty of this low-level marketing ploy: Mount of Olives. Man, it doesn’t even taste like oolong! It’s stale as hale and I took one sip and poured the rest out. I can’t even be funny in this review. This tea blows. After Mike ripped this tea a new sachet, I had to dive in and see wii. I’d like to disagree, but he right. This Prince of Peace Oolong Tea is more like Prince of Peace A Little Hojicha Mixed With Parakeet Food Blended With Crabgrass. I mean honestly they might have fudged on the nomenclature straight up. The tea has the hearty notes of a genmaicha with the crisp, hay-like finish of a hojicha tea. 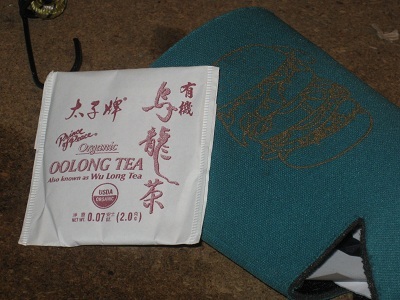 – neither of which are an oolong. I got this tea from my mom so perhaps it could be three years old, but I digress. Your tea should not shapeshift like a mutant during its shelf life. Prince of Peace Tea reviews usually come with good graces, and I’m not really mad at the actual taste of the tea. The problem is lying to the voters. Not just a little white lie like “two chickens in every pot” but I’m talking like “free whiskey Fridays worldwide” kinda lie. This is the latter, and for that, fail. Anybody want some Prince Of Peace? TeaAmigos ain’t drinking it. Hit us up.